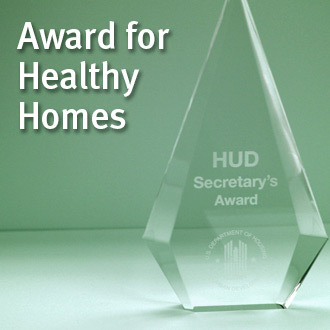 The U.S. Department of Housing and Urban Development, in partnership with the National Environmental Health Association (NEHA), announces the first annual Secretary’s Awards for Healthy Homes. These awards recognize excellence in healthy housing innovation and achievement in three categories: Public Housing/ Multifamily Supported Housing, Public Policy, and Cross Program Coordination among Health, Environment and Housing. The awards were presented at the NEHA Annual Educational Conference & Exhibition in Orlando, Florida on July 13, 2015. See 2015 award winners here.